Some or all of my patients aren’t showing up on the iPhone or Watch app. First, verify that the patient problem is only happening on the iPhone and/or Watch App. Check whether all patient appointments are showing up correctly. If they are, proceed to step 1 of the next section. If not, it may be a problem with your Simplifeye Agent. Next, we'll try to isolate the problem to the iPhone or the Watch. Pull down from the top of the app to refresh patients. If they are, proceed to step 1 of the next section. If not, continue. Verify that you're connected to Wi-Fi, or are using cellular data. You can do this by opening the browser on your iPhone and going to any website. If you have connectivity and have refreshed the App but are still not seeing the correct patients, contact Simplifeye support. Verify whether patients are showing up on the Watch. Since you're already logged in to Simplifeye on the iPhone, all you need to do is open the Simplifeye app on your Watch. Check whether all patient appointments assigned to you are showing up on the Watch (Note: on the Watch you will only see patients who are assigned to YOU). If they are, everything is working as expected! If not, read on. Check whether your Watch is within range of the iPhone. The Watch does not work if its paired iPhone is too far away. 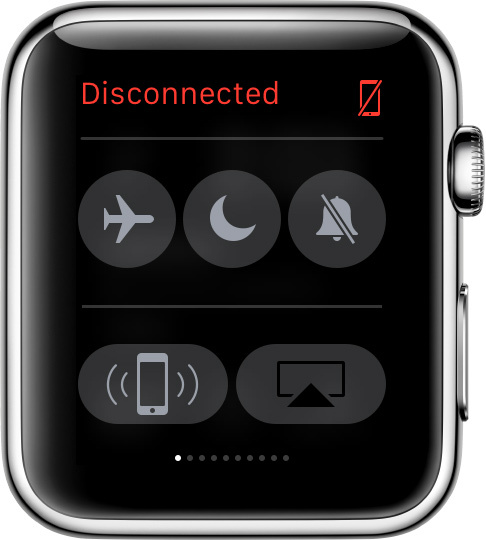 If there's a red crossed-out iPhone icon on your Watch screen, it means you have to get closer to your iPhone. If you are in range of your iPhone and still not seeing the correct patients assigned to you on the Watch, contact Simplifeye support.